Nonfiction – paperback; Faber and Faber; 288 pages; 2005. I read this beautiful, lyrical and tear-inducing autobiography in just two sittings. With no chapters or natural breaks, I just could not tear my eyes away from John McGahern’s seamless narrative. 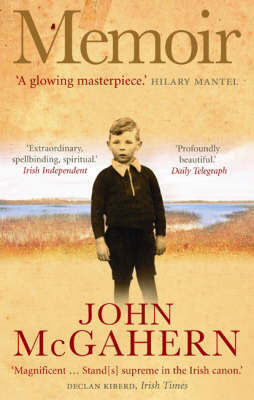 Concentrating mainly on his childhood and adolescence growing up in rural Ireland in the 1940s and 1950s, it is very much a love letter to his adored mother, an accomplished school teacher, who died of breast cancer when he was eight years old. It is also a heartfelt exploration of the ambiguous and complicated relationship with his father, a police sergeant, who ruled the family — McGahern, the eldest child, had six younger siblings — with a vicious tongue, temperamental mood swings and powerful fists. At times the grief resonates off the page — the account of his mother’s illness, in which the family was moved out, furniture and all, to the police barracks in a different village while she lay upstairs in her sickbed seemed unbelievably cruel. During the several weeks in which she lay in her sickbed dying, her husband — McGahern’s father — did not once visit her to offer comfort or companionship. This is something that stays with McGahern for the rest of his life: his inability to understand his father’s lack of care or consideration for others close to him. Despite this, Memoir is not a soppy book. And by no means is it anywhere near as cloying as Frank McCourt’s Angela’s Ashes (which, by the way, I loved when I read it several years ago). The difference here is that McGahern is not seeking sympathy, but recounting honestly and truthfully what it was like to grow up with a widower father, who could not relate to those he supposedly loved and found it easier to lash out than bite his tongue. In many ways the book is about McGahern coming to terms with the fact that he will never understand his father. What I found most interesting is how McGahern mined the events of his life for his fiction. I can’t tell you how many times I felt the penny dropping as I read specific incidences: just the mere fact that his beloved mother had died of breast cancer explained much about the clear-eyed realistic portrayal of a woman grappling with illness in his debut novel The Barracks. There are other bits — the unspecified sexual abuse as he shares his father’s bed, the desire to enter the priesthood and the rescue of his sister from a boss who molests her — that appear in his second novel, The Dark. Similarly, his father’s remarriage to a younger woman, the strength of his love for his sisters and the continual running away of his youngest brother, feature in his Booker shortlisted book Amongst Women. I also found it interesting to read about McGahern’s life as a writer: how he first discovered literature (a local priest had a wonderful library he was allowed to riffle); when he first realised he wanted to be a writer and not a priest or a farmer, two options that had been open to him; and how he dealt with the ups and downs of his career (lauded by the literary elite, banned by the Irish censors). All in all, fans of McGahern’s fiction will find much to admire in this wise and compelling book, but even if you have not read any of his novels or short stories this is a must read memoir that will have you rushing to read everything he has ever written. I covet a copy of Amoz Oz’ memoir of his parents, which is available at a bookshop near my place of work. Dean, I’ve not ever read anything by Amos Oz. Can you recommend any particular titles? I’ve also read ‘My Michael’. He’s a wonderful writer. He has such grace that you feel soothed by his prose. There is a great deal of biting humour to keep you interested. His invention is unrivalled. Coming in late on this one, but Oz’ memoir A Tale of Love and Darkness is one that I give consistently as a gift. The last paragraphs alone are astonishing – breathtaking.